Therapeutic Grade Oils, 5 ml. Among all the Rasayanas, Chyawanprash is most famous. It is the most popular rejuvenating Ayurvedic tonic in India. Chyawanprash has the consistency of jam and contains 20-80 herbs and spices, including the all important tropical gooseberry, Amla (Embellica Officinalis), the world's richest natural source of vitamin C. It works on the immune system by protecting the body against everyday infections that cause coughs, colds, and fevers. It can be used by children, old persons, tubercular patients, and debilitated persons. Suggested Use: 1 or 2 teaspoonfuls, twice a day. Can be taken on bread or crackers or with milk, juice, or a soft drink. Precautions: Chyawanprash has been used safely in India for several centuries. However we suggest that this product not be used if you are pregnant or nursing. 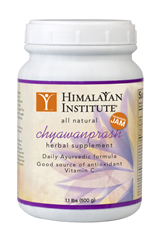 Chyawanprash, 10 oz., Now with Fresh Amla! Traditional Ayurvedic herbal jam made with amalaki, the world"s best source of vitamin C. Chyawanprash is India"s most famous rejuvenative and antioxidant jam. Besides Emblica officinalis, the jam contains ghee (clarified butter), raw honey, and many herbs and spices that together promote deeper assimilation of nutrients. From the supplier: the "Ayurvedic One-A-Day" with wildcrafted ingredients. The most authentic formula available in the U.S. Imported direct from India with complete safety testing and quality control. Ingredients: standardized extracts of Indian gooseberry (emblica officinalis), Guduchi (Tinospora cordifolia), Shatawari (asparagus racemosus), Udakiryaka (caesalpinia digyna), Arjun (terminalia arjuna), Japa (herpestis monniera), Shank Pushpi (evolves alsinoides), Ashwagandha (withania somnifera), Bilwa (aegle marmelos), clerodendron phlomidis, Shyonaka (oroxylum indicum), Gunbhari (gmelina arboria), stereospermum suaveolens, Bala (sida cordifolia), Dhatura (desmodium gangeticum), uraria lagopoides, phaseolus tribbus, termanu labiais, Indian Long pepper (piper longum), solanum indicum, Kanta Kari (solanum xanthocarpum), Pistaceo (pistacia integerrima), Bhumy Amalaki (phyllanthus niruri), Draksha (vitis vinifera), Haritaki (terminalia chebula), hedychium spicatm, Musta (cyperus rotundus). The combination of the 36 selected herbs and fruits along with four food ingredients in this nutritionally rich tonic has traditionally been used to enhance general health, increase mental and physical energy, and support the body"s natural resistance to disease. The principle herb in Chyawanprash, Amla fruit (Amalaki) is fresh (not powdered). Regular consumption of Chyawanprash is believed to rejuvenate and fortify both the mind and body and is beneficial to people of all ages and constitutions. Ingredients: Amla fruit (Phyllanthus emblica), Indian Kudzu root (Pueraria tuberosa), Long Pepper fruit (Piper longum), Mysore Cardamom seed (Elettaria cardamomum), Malabar nut tree leaf (Justicia adhatoda), Spanish Pellitory root (Anacyclus pyrethrum), Arjuna bark (Terminalia arjuna), Ashwagandha root (Withania somnifera), Shatavari root (Asparagus racemosus), Bacopa leaf (Bacopa monniera), Holy Basil leaf (Ocimum sanctum), Terminalia chebula fruit (Terminalia chebula), Ginger rhizome (Zingiber officinale), European grape fruit (Vitis vinifera), Licorice root (Glycyrrhiza glabra), Sacred Lotus flower (Nelumbo nucifera), Jatamansi root (Nardostachys jatamansi), Neem leaf (Azadirachta indica), Tribulus fruit (Tribulus terrestris), Bael fruit (Aegle marmelos), Indian Tinospora stem (Tinospora cordifolia), Phyllanthus herb (Phyllanthus niruri), Zedoary rhizome (Curcuma zedoaria), Cyperus rhizome (Cyperus rotundus), Indian Elecampane root (Inula racemosa), Heart Leaf Sida root (Sida cordifolia), Himalayan Pistachio fruit (Pistacia integerrima), Leptadenia leaves (Leptadenia reticulata), Boerhavia root (Boerhavia diffusa), Fig (Ficus carica), Clove bud (Syzygium aromaticum), Cinnamon bark (Cinnamomum verum), Indian Cassia leaves (Cinnamomum tamala), Mesua flower (Mesua ferrea), Saffron stigma (Crocus sativus) with Sugarcane (Saccharum officinarum), Clarified butter (Ghee), Honey, and Sesame oil. 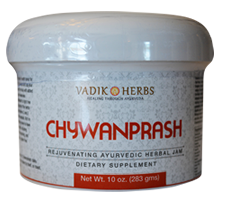 Chyawanprash is a highly revered rasayana tonic whose first authenicated formula was published in the 4th century B.C. It is usually produced as a jam, based on amla, a tropical gooseberry with 30 times more vitamin C than oranges. This formula has been modified so as to make it available in capsule form. The sweeteners and oils have been omitted along with a few herbs and spices. Ingredients: standardized extracts of Emblica officinalis, Tinospora cordifolia, Asparagus racemosus, Caesalpinia digyna, Terminalia arjuna, Herpestis monniera, Evolvulus alsinoides, Withania somnifera, Aegle marmelos, Clerodendron phlomidis, Oroxylum indicum, Gmelina arborea, Stereospermum suaveolens, Sida cordifolia, Desmodium gangeticum, Uraria lagopoides, Phaseolus trilobus, Termanus labialis, Piper longum, Solanum indicum, Solanum xanthocarpum, Pistachia integerrima, Phyllanthus niruri, Vitis vinifera, Terminalia chebula, Hedychium spicatum, Cyperus rotundus. Chyawanprash, taken daily will support all 3 Doshas. It has nearly 40 ingredients for support and strengthening of all of the body"s systems. It is the most widely used Ayurvedic supplement in the world, taken daily by millions. Please note that this product is available in two sizes: 8 oz. and 16 oz. Ingredients: A properietary mix of: Indian gooseberry** (free fruit rind),Unrefined sugar, Clarified butter (milk), Honey**, Piper longum (fruit), Cinnamomum zeylanicum (bark), Cinnamomum tamala (dried leaves), Ellataria cardamomum (fruit), Mesua ferrea** (anthers). Extracts of Asparagus racemosus (roots), Tacca aspera** (rhizome), Ipomoea digitata** (rhizome) Withania somnifera (roots), Piper longum (fruit), Ellataria cardamomum (fruit), Oroxylum indicum** (bark), Solanum indicum (stem & root wood),Tinospora cordifolia** (stem), Terminalia chebula** (fruit), Apocynym foetidum** (whole plant), Boerhaevia diffusa** (roots), Phyllanthus niruri** (whole plant), Adhatoda vasica** (whole plant except roots), Aegle marmelos** (bark), Premna integrifolia** (wood), Gmelina arborea** (bark), Stereospermum suaveolens** (bark),Desmodium ganeticum** (leaf and tender shoots), Uraria lagopodies** (bark), Nelumbium speciosum** (flowers), Solanum xanthocarpum (whole plant), Tribulus terrestris** (fruit), Gymnema sylvestere** (whole plant), Curcuma zedoaria** (rhizome), Pistacia integerrima** (galls), Cyperus rotundus** (rhizome), Vitis vinifera (fruit). *The material provided on this site is for informational purposes only. The author is not a medical doctor. The statements made represent the author's personal opinions and are not intended to replace the services of health care professionals. The content and products discussed have not been evaluated by the Food and Drug Administration. The information on this page and the products available on this site are not intended to diagnose, treat, cure, or prevent any disease.